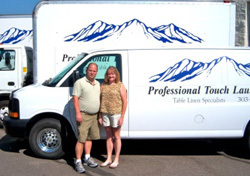 Tom has owned and operated Professional Touch Laundry Service for 20+ years. He has 16 years of prior experience in industrial laundries. Tom is a very hands-on person, keeping the business on the leading edge of new technology, equipment and products. Mari is co-owner of Professional Touch Laundry Service. She keeps the accounting up to the highest standards while assisting with daily operations. Rest assured that all your accounting concerns will be handled on a personal level and in a timely manner. We look forward to working with you for all your table linen needs. For Sales & Service, we will be there for you when it counts!